Access Panel, Access Panels, Plastic Access Panel, ABS Plastic Access Panel, Wall Access Panel, Ceiling Access Panel, Access Door, Wall Access Door, Ceiling Access Door by Access Able ®. Wall Access - Use an access panel to access wires, valves, cables, conduits inside a wall by cutting an opening into the drywall or sheetrock and installing an access panel. Perfect for home security installations and home theater installations. Ceiling Access - Use access panels to access vents, wiring, cable shafts, conduits inside a ceiling. Simply cut an opening into your ceiling, apply a bead of adhesive on the outer flange and press the access panel frame in place. Perfect for any application that requires a whole to access a ceiling. Access Holes in Furniture - Access panels are perfect for hiding unsightly wiring. Cut an opening into closets or desks, install an access panel, and use the pre notched knock-outs in the access door to pull through wiring. Home Security Applications - Need to install a hidden valve or sprinkler control panels, outside camera wiring, or other home security applications? The access panel is your solution. Simply use the access door frame as a template to draw the size of the opening needed, use a saw to cut out the opening and insert the access panel. Outdor Pool and Hot Tub Installation - An access panel comes in handy when installing pool pump valve and pool filter related equipment. Access panels provides easy access. Simply use a screw driver or similar, insert it into one of the door release holes and pop out the access door. The high impact ABS Plastic material of the access panel is UF treated and does not fade and is water resistant. A real time saver for professional installers as well as do-it-yourselfers. Bathroom Renovation Projects - Replacing your bath tub with a new whirlpool tub? Need access to your wall. Look no further. The access panel is easy to install and easy to use. 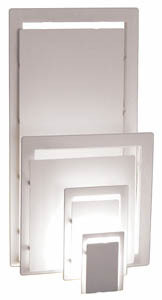 Create a seamless look by installing the reversible access frame in a flush mount prior to building your wall. Simply nail the outer flange to the wood framing and build up the drywall to the lip of the frame to create a flush mount installation. Now you can even tile on the access panel door to create that seamless look. Mobile Home, Travel Trailer, Fifth Wheel and Manufactured Homes Applications - The Access Panel is the perfect solution whenever you need wall or ceiling access. Create an outside access door in minutes. It's easy to install and very durable. Perfect for indoor and outdoor applications. Wherever access is needed - Think Access Panels. Access Panels come in a wide variety of sizes. The 5 most common access panel sizes are listed out below. Please use the diagram to refer to size information in the access panel size table. You can use the "Buy Now" link to purchase an access panel direct from Pro Products Sales. Pro Products Sales offers the most competitive per piece price, structured volume pricing for contractors, builders and resellers. At times Pro Products Sales can offer freight allowed on larger orders shipping within the Continental US. Please call for details. *Reflects 48 piece volume discount price. **Reflects 96 piece volume discount price. Access Able ® Access Panels by Sachwin Products, Inc.